A market economy is a system where the laws of supply and demand direct the production of goods and services. Supply includes natural resources, capital, and labor. Demand includes purchases by consumers, businesses, and the government. Businesses sell their wares at the highest price consumers will pay. At the same time, shoppers look for the lowest prices for the goods and services they want. Workers bid their services at the highest possible wages that their skills allow. Employers seek to get the best employees at the lowest possible price. Capitalism requires a market economy to set prices and distribute goods and services. Socialism and communism need a command economy to create a central plan that guides economic decisions. Market economies evolve from traditional economies. Most societies in the modern world have elements of all three types of economies. That makes them mixed economies. 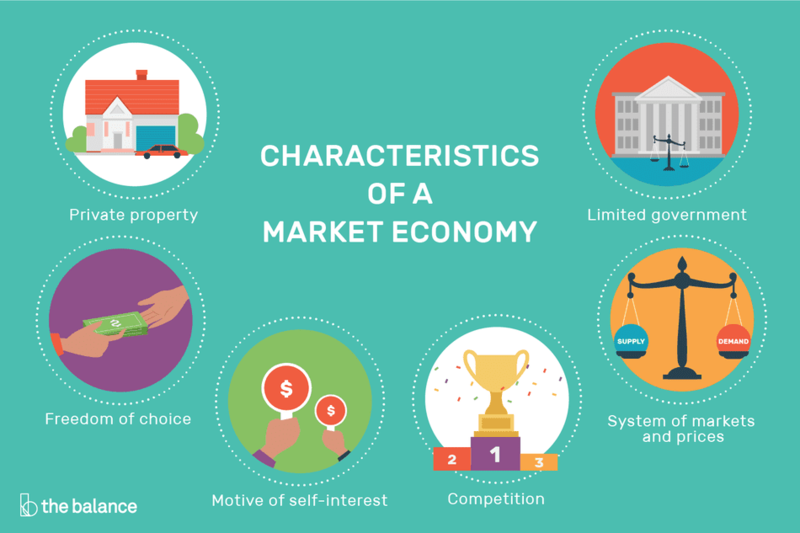 The following six characteristics define a market economy. Private Property. Most goods and services are privately-owned. The owners can make legally-binding contracts to buy, sell, or lease their property. In other words, their assets give them the right to profit from ownership. But U.S. law excludes some assets. Since 1865, you cannot legally buy and sell human beings. That includes you, your body, and your body parts. Freedom of Choice. Owners are free to produce, sell, and purchase goods and services in a competitive market. They only have two constraints. First is the price at which they are willing to buy or sell. Second is the amount of capital they have. Motive of Self-Interest. Everyone sells their wares to the highest bidder while negotiating the lowest price for their purchases. Although the reason is selfish, it benefits the economy over the long run. This auction system sets prices for goods and services that reflect their market value. It gives an accurate picture of supply and demand at any given moment. Competition. The force of competitive pressure keeps prices low. It also ensures that society provides goods and services most efficiently. As soon as demand increases for a particular item, prices rise thanks to the law of demand. Competitors see they can enhance their profit by producing it, adding to supply. That lowers prices to a level where only the best competitors remain. This competitive pressure also applies to workers and consumers. Employees vie with each other for the highest-paying jobs. Buyers compete for the best product at the lowest price. There are three strategies that work to maintain a competitive advantage. System of Markets and Prices. A market economy relies on an efficient market in which to sell goods and services. That's where all buyers and sellers have equal access to the same information. Price changes are pure reflections of the laws of supply and demand. There are five determinants of demand. Limited Government. The role of government is to ensure that the markets are open and working. For example, it is in charge of national defense to protect the markets. It also makes sure that everyone has equal access to the markets. The government penalizes monopolies that restrict competition. It makes sure no one is manipulating the markets and that everyone has equal access to information. Since a market economy allows the free interplay of supply and demand, it ensures that the most desired goods and services are produced. Consumers are willing to pay the highest price for the things they want the most. Businesses will only create those things that return a profit. Second, goods and services are produced in the most efficient way possible. The most productive companies will earn more than less productive ones. Third, it rewards innovation. Creative new products will meet the needs of consumers in better ways that existing goods and services. These cutting-edge technologies will spread to other competitors so they, too, can be more profitable. This illustrates why Silicon Valley is America's innovative advantage. Fourth, the most successful businesses invest in other top-notch companies. That gives them a leg up and leads to increased quality of production. The key mechanism of a market economy is competition. As a result, it has no system to care for those who are at an inherent competitive disadvantage. That includes the elderly, children, and people with mental or physical disabilities. Second, the caretakers of those people are also at a disadvantage. Their energies and skills go toward caretaking, not competing. Many of these people might become contributors to the economy's overall comparative advantage if they weren't caretakers. That leads to the third disadvantage. The human resources of the society may not be optimized. For example, a child who might otherwise discover the cure for cancer might instead work at McDonald's to support her low-income family. Fourth, the society reflects the values of the winners in the market economy. A market economy may produce private jets for some while others starve and are homeless. A society based on a pure market economy must decide whether it's in its larger self-interest to care for the vulnerable. If it decides it is, the society will grant the government a significant role in redistributing resources. As such, there are so many mixed economies. Most so-called market economies are mixed economies. Article I, Section 8 protects innovation as property by establishing a copyright clause. Article I, Sections 9 and 10 protects free enterprise and freedom of choice by prohibiting states from taxing each other’s goods and services. Amendment IV protects private property and limits government powers by protecting people from unreasonable searches and seizures. Amendment V protects the ownership of private property. Amendment XIV prohibits the state from taking away property without due process of law. Amendments IX and X limit the government's power to interfere in any rights not expressly outlined in the Constitution. The Preamble of the Constitution includes a goal to "promote the general welfare." The government could take a larger role than what a market economy prescribes. This led to many social safety programs, such as Social Security, food stamps, and Medicare.